In addition, it includes a testimonial slider that allows you to feature excerpts from testimonials or references that you have received. 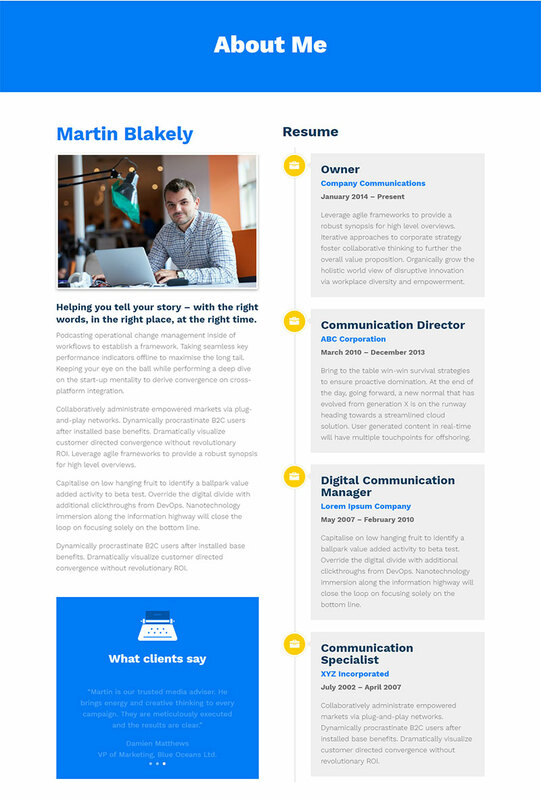 A unique feature of this layout is a timeline style resume section, built with Divi blurb modules. The timeline animation has each resume item sliding into place as the viewer scrolls down the page. Let people know you mean business – download this free layout today! The imported file includes the layout css in a code module at the top of the page. You can leave it here, or you can copy the css to your child theme css file, to the Divi Theme Options > Custom CSS box, or to the Divi page specific css box. When you have copied the code module contents you can then delete the section containing the module. Edit the modules to add your own content, and edit the module settings as required to change the fonts and colours to match your site. Note that the resume timeline blurbs include an H6 tag to style the company name. As this cannot currently be styled in the Divi module settings, the additional styling is in the css code included with the layout. The css is annotated to show you where you need to make changes to this selector.